BugShot Mozambique May 20-29th, 2018! Note you will need to take anti-malaria medication while in Mozambique please see your doctor for details of other vaccinations or medications you will need. • Workshop is based out of Gorongosa National Park in Mozambique, Africa. Join professional photographers Piotr Naskrecki , Thomas Shahan, Nicky Bay and John Abbott for a 4-day workshop exploring tropical insects and spiders with some of the best insect photographers in the world! Special techniques: UV photography, High Speed Photography, and photo stacking. Events kick off with a Sunday evening welcome (May 20th) and will continue through Tuesday morning (May 29th). Venue: Gorongosa National Park is an amazingly diverse place which you have likely followed via Piotr Naskrecki. Here is a description of the diversity on the Gorongosa website: The true diversity of Gorongosa’s micro world is still a mystery, and the exact numbers of species of insects, spiders, or frogs living in the Park are unknown. But each day brings new discoveries: recently, scientists have confirmed that at least 200 species of ants live in Gorongosa, and some of these can be found nowhere else in the world. The diversity of grasshoppers, praying mantids, beetles, and frogs are similarly rich. It’s possible that the diverse ecosystems of Gorongosa National Park are home to at least 50,000 species of insects and other small animals. Price includes: All scheduled course activities, lodging, meals, and transportation to/from the airport in Beira. The workshop price does include a short 30 minute flight in a 7 passenger plane from Beira to Gorongosa National Park. 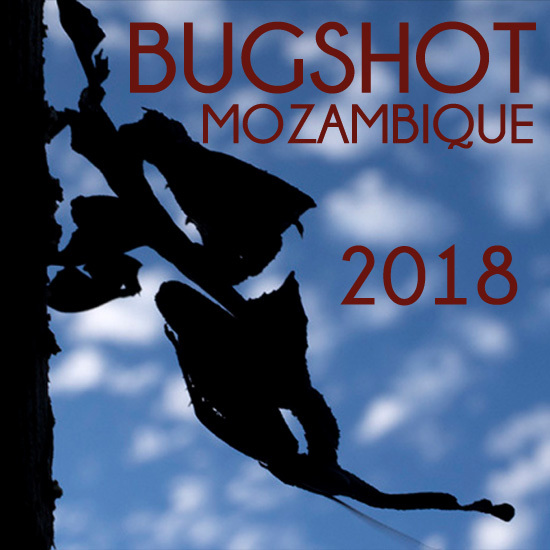 Click here to return to the BugShot Mozambique information page.